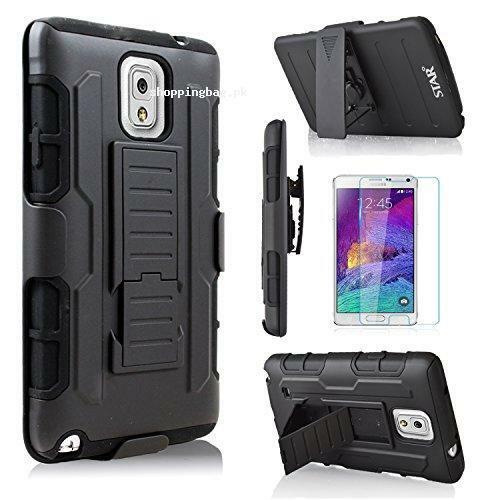 Designed specifically for SAMSUNG GALAXY NOTE 3, Hard poly-carbonate plastic shell on soft, flexible silicon skin that amazingly against drops that will shatter screen. The build in kickstand can be used in landscape orientation for hands free experience. when viewing multimedia, with belt clip holster so you can carry the device wherever you go. Premium HD screen protector prevents scratches without compromising sensitivity. Starshop Inc ship all orders out within 24 hours Monday to Friday (exclude weekends and Holidays). We offer 7 days money-back guarantee and manufacture warranty on all Starshop product.